Each one has already posted big gains year-to-date, but I don't think their rallies are over yet. I'm a value investor at heart, so it has always been hard for me to buy stocks that are trading near their 52-week highs. However, I've come to learn that buying "momentum" stocks can actually be a winning long-term strategy. After all, Wall Street tends to reward stocks only if they are doing something right, which indicates that the underlying company could be a high-quality business. Paying up to own shares of these companies can sometimes prove to be a savvy move. Paycom (NYSE:PAYC) is a provider of cloud-based human capital management software. The company's easy-to-use system helps small and medium-size businesses to perform a number of mission-critical HR tasks such as background checks, payroll processing, and scheduling. Paycom's customers love that they can manage all of these functions with a single system, so they've been signing up in droves. Last quarter, Paycom's top line grew by a strong 51%. That led to EPS more than doubling to $0.21, which blew past the $0.13 that Wall Street was expecting. Analysts have been raising their earnings estimates all year long to account for its stellar growth, but Paycom hasn't had any trouble thus far staying one step ahead of them. Given that 98% of the company's revenue is recurring, I think that Paycom stands a good chance of keeping that trend alive for the foreseeable future. If that turns out to be the case, then opening up a position even at today's elevated prices could prove to be a profitable move. 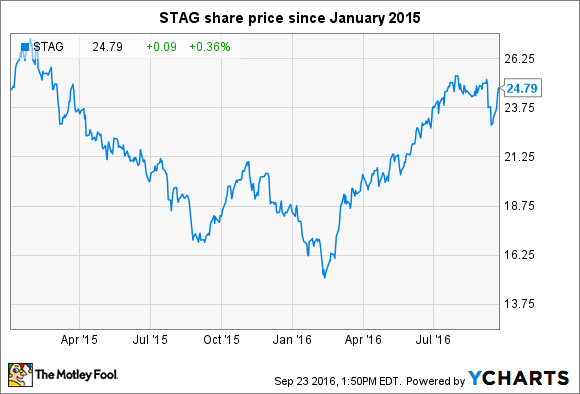 Stag Industrial (NYSE:STAG) isn't a typical real estate investment trust. Its niche is to buy industrial properties that house single occupants, which is risky, given that such properties can go from 100% occupied to 0% in a flash. That's why many other REITs refuse to compete in this space. However, Stag mitigates this risk by owning hundreds of individual properties, so its financial statements are quite predictable. Stag has a stated goal of growing its asset base by 25% annually, so it went on a hiring binge in late 2015 to help it hit that number. However, Wall Street didn't like that the company's expenses were growing as fast as revenue, so the company's share price was mauled. Management got the message loud and clear, and has since promised to grow adjusted funds from operations -- which is REIT speak for earnings -- right along with revenue. The markets cheered the strategy shift and have reinflated the company's share price in response. Despite the recent rally, I don't think the run is over. Stag believes that its has only captured about 1% of its total addressable market, which gives it a massive runway for expansion. With management now focused on revenue and profit growth, share prices look poised for continued gains. The robotic surgery kingpin is on a roll. Intuitive Surgical (NASDAQ:ISRG) has slammed past Wall Street's estimates in its past four quarterly reports, which caused shares to rally. Better yet, it recently bumped up its procedure growth guidance for the full year, which tells me that physicians are continuing to find new ways to utilize its da Vinci system. That fact should keep the gravy train rolling. After all, the company's razor/razor blade business model allows it to pull in high-margin revenue every time a procedure is performed using one of its systems. With more than 3,745 systems currently installed worldwide, that revenue adds up quickly. Looking ahead, industry experts believe that demand for robotic surgery is poised for substantial growth. Some market watchers are even calling for $20 billion in annual sales by 2021. That's a massive number when compared to Intuitive's 2015 revenue of $2.4 billion.